Obituary for Pamela Sue (Cook) Farber | Kroeze-Wolffis Funeral Home, Inc.
Pamela Sue Farber went home to be with Jesus on January 21th 2019 at home surrounded by loved ones. Pam was born on March 24, 1953 in Shelby MI, to Margaret and Henry Cook and lived in Newaygo until she went to college. Pam worked for many years as a lunch aid for Holton Public Schools and for over a decade at Country Side Daycare with her good friend Kathy Vantreese. Pam loved devoting her time every Sunday and Friday movie night to the Holton United Methodist Church to care for the children in the nursery. Pam loved spending time in her yard planting flowers and making her yard beautiful with many fountains. She loved yard sales and going with her Amish friend Kathy, daughter Tammy and family. Pam was extremely talented at sewing and loved making beautiful quilts with her friend Pat and daughter in law TracyLynn. 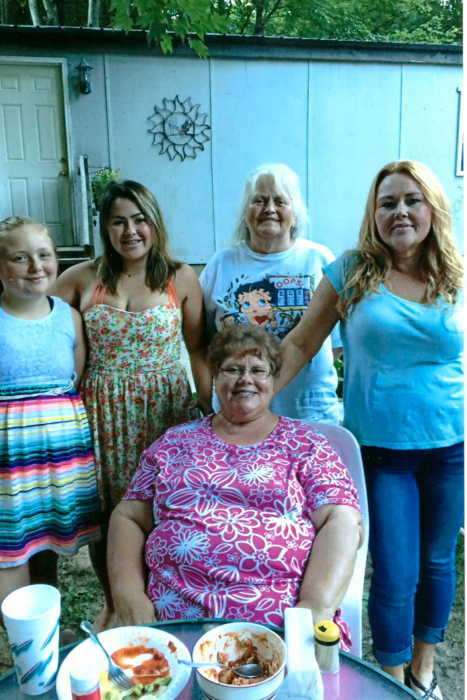 Pam enjoyed daily chats on the phone with her grandkids, children, and sisters Patty and Debbie. Pam loved her family above all and devoted all her time to being a wonderful mother to her three children and amazing grandmother to her eight grandchildren. Her best friend the one she laughed with, cried with, loved life with, her sister in law Darlene Gonzales had a bond that was unbreakable and enjoyed spending time together over the years. Pam is survived by her husband Albert Farber, Son Tim Farber (Alex) of Holton, Son Eric Farber (TracyLynn) of Newaygo, Daughter Tammy Hayford (Patrick) of Twin Lake, Sister Carol Cook of Newaygo, Sister Debbie Peterson of Grand Rapids, Sister Patty Motney(Menzo) of Muskegon, Sister in law Darlene Gonzales(Ralph) of Texas, Sister in law Janet Cook of New Era, Brother in law Floyd Farber( Deb) of Indiana, step brother in law Mark Seng, Grandchildren ( Her World) Brianna Farber, Kayley Farber, Jacob Farber-Hayford, Garet Farber-Hayford, Lukus Farber, Kade Farber, Heidi Farber, Sara Farber, Mother in law Eva Farber of Muskegon, many nieces and nephews, uncles and aunts. Preceded in Death her parents Margaret and Henry Cook, Brother Jim Cook, Brother Paul Christensen, Brother in law Is Velez, Sister in law Winnie Velez, mother in law Dorothy Farber, father in law George Farber. Per Pam’s wishes cremation has taken place and she requested a Celebration of Life to take place. It will be held on February 9,2019 at 11:00am at the Holton United Methodist Church 9530 Holton Duck Lake rd Holton MI 49425 with Pastor Matt Stoll offering. A luncheon will follow at the church.